After Special Counsel Robert Mueller released his Michael Flynn sentencing memo on Tuesday, we saw Donald Trump’s criminal defense attorney Rudy Giuliani short-circuit on a level that was jarring even by his standards. Rudy went off about “special whatever” and “sick puppies” and other bizarreness. Then on Wednesday, Mueller made a criminal referral that we think may be targeting Rudy. Today, Rudy seems to be waving the white flag. Rudy Giuliani admitted to the Atlantic today that Donald Trump is an impossible client. Rudy revealed that it took him weeks to walk Trump through the process of answering Mueller’s written questions, when it should have taken just a couple days, implying that there’s something wrong with Trump’s cognitive abilities. Then Rudy admitted that he can’t get Trump to stop tweeting incriminating things about the investigation, which is really weird, considering how often Rudy tweets incriminating things about the investigation. This entire lengthy piece from the Atlantic feels like it’s Rudy Giuliani’s come-to-Jesus moment. He’s distancing himself from Trump’s obviously-perjured answers. He’s accusing Trump of being out of control. Rudy does have a problem with running his mouth and admitting things he shouldn’t, but not on this level. 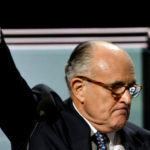 This is Rudy waving the white flag. From the start, we’ve all instinctively known that Rudy Giuliani only joined Donald Trump’s criminal defense team in the hope of getting himself off the hook. Now, just one day after a Robert Mueller criminal referral that we think just sealed Rudy’s fate, suddenly Rudy is giving up on the whole idea of being Trump’s rescuer, and distancing himself from the whole Trump mess. Funny how that works.